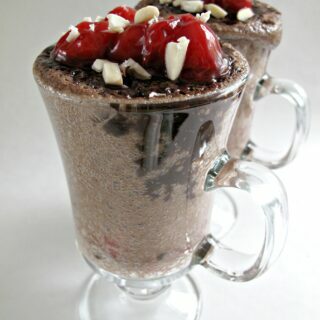 3-2-1 Black Forest Mug Cake is an individual chocolate cake drenched in chocolate syrup and topped with cherry pie filling, adding a German twist to the list of Monday Box mug cakes. They may not be totally authentic Black Forest cake, but they are totally delicious. My parents gave my husband and me our first microwave as a housewarming gift 26 years ago. Over the years, it zapped countless cups of hot water and defrosted infinite amounts of frozen food. Most recently, it magically produced mug after mug of 3-2-1 cake experiments. The weakest link on that appliance was the plastic door opening button. The microwave was still fully functional but some bit of internal plastic would crack and the door wouldn’t open. My husband used superglue to repair the mechanism several times but this last time the plastic was no longer salvageable. I had no choice but to get a new microwave. I don’t like getting new machines. If I am happy and comfortable with what I have, I don’t want to deal with learning new buttons and gadgets. I get something new, I complain a lot, then I get used to it and life goes on. With my new washing machine that means a number of highly wrinkled loads before I get the knack of high efficiency (Where is all the water?!?). With my new microwave that meant a number of 3-2-1 cake explosions and a few 3-2-1 cake hockey pucks before I fully grasped how much stronger my zapping power now is. My 3-2-1 Black Forest Mug Cake was fully cooked in my new microwave in 35 seconds. “3-2-35 second cake” doesn’t have the same ring to it, so I am not changing the name, but I am adding this note. Zap your 3-2-1 cakes until done. Done means the wet batter has turned into cake. After “done” comes dried out. After “dried out” comes the hockey pucks I previously mentioned. More powerful microwaves perform faster magic. Adjust cooking times to your appliance. Real Black Forest Cake includes layers of chocolate cake, whipped cream, and cherries. In Germany, where the cake originated, it is traditional (and legally mandated) to add a tart cherry liquor. 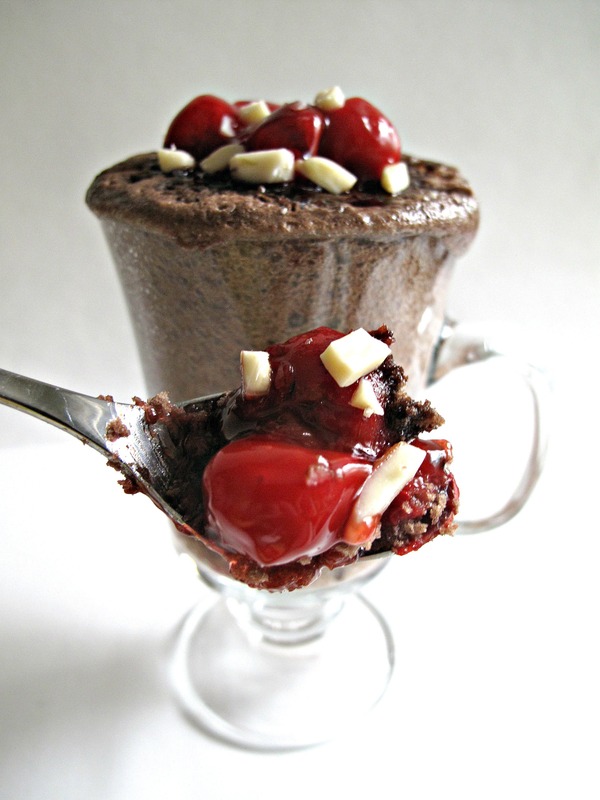 3-2-1 Black Forest Mug Cake doesn’t share all of those characteristics, but it is chocolaty and full of cherries. The ingredients are all shelf stable and care package mailable. 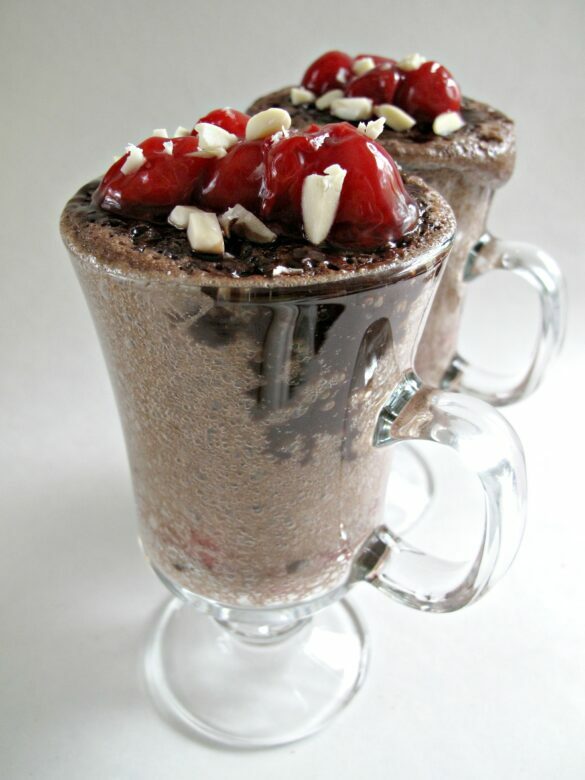 However, if you are enjoying 3-2-1 Black Forest Mug Cake at home, add a dollop of whipped cream on top give this microwave wonder more traditional flavor. (Here comes the 3-2-1 part) Into the prepared mug, stir together 3 tablespoons of cake mix and 2 tablespoons of water. Add a rounded tablespoon of cherry pie filling. Add a generous drizzle of chocolate syrup, another tablespoon of cherry pie filling and a sprinkle of chopped almonds. Then eat it right out of the mug. 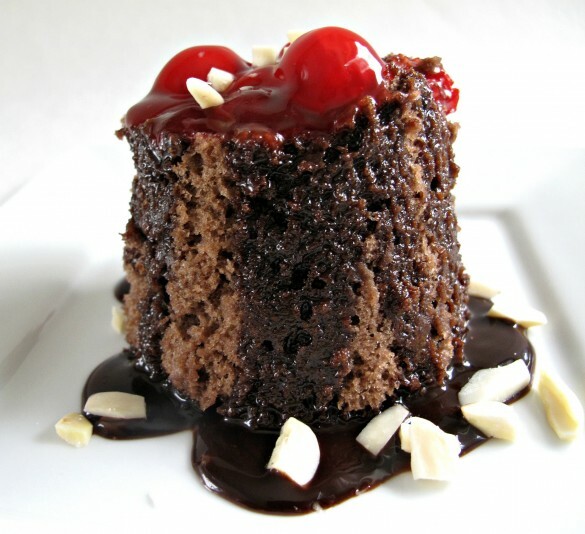 If you want to transfer the cake onto a plate, run a knife around the edge between the cake and the mug to loosen, dump out onto a plate, then add the syrup, cherries, and almonds. Combine the two cake mixes into a labeled gallon-size ziplock bag. Include a measuring spoon, a bottle of chocolate syrup, a can of cherry pie filling, and a bag of slivered almonds. If the care package is international, include microwave safe paper cups. If the care package is domestic, add either a can of non-stick spray (for use with a ceramic mug) or microwave safe paper cups. Adjusting to new gadgets can be very frustrating! When we moved to NC it took what felt like forever to get the hang of our oven … so different from the one we had in Virginia! Love this latest version of your 3-2-1 cakes! This is so cool. I’ve heard about cakes in a mug, etc. but haven’t tried one yet. Moist, warm delicious cake – amazing! I remember as a kid if the microwave broke we went to the store that day and got a new one, lol. I love a mug cake ,this is fabulous! I’m starting to think of you as the queen of the 3-2-1 cakes, Wendy. Love the very idea…okay, maybe just a little *too* convenient to be safe. 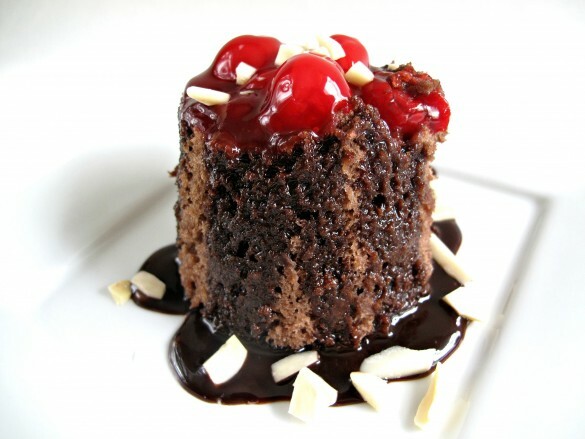 ; ) This black forest cake looks irresistible! Thanks, Monica! I didn’t set out to be a 3-2-1 enthusiast. As a matter of fact I thought of it as a one time novel idea to post while I was on vacation last year.But the response was overwhelming and surprising. 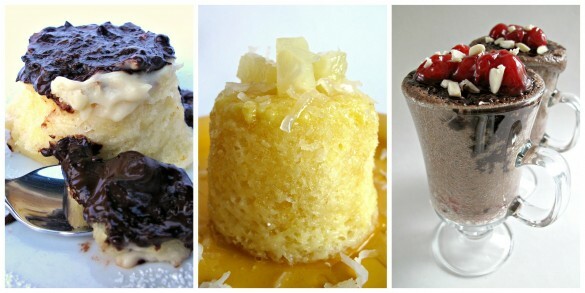 3-2-1 Magic Mug Cake is my number 1 visited post EVERY DAY! Apparently people want microwave convenience with sweet flavor appeal. If I want readers to visit the Monday Box I need to post what they are interested in. 🙂 Hopefully, I can show that 3-2-1 cakes can be yummy as well as fast and convenient! 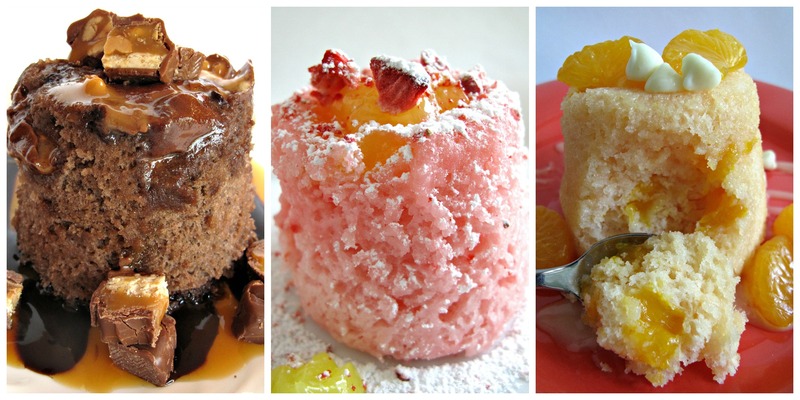 My mouth is watering just looking at these photos!! I am kind of a boring microwave owner: I just nuke the usual suspects but I’ve never made dessert in it before! 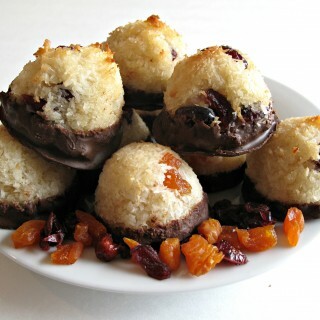 This is a great idea for a quick dessert at home or to send in a care package! Bravo! 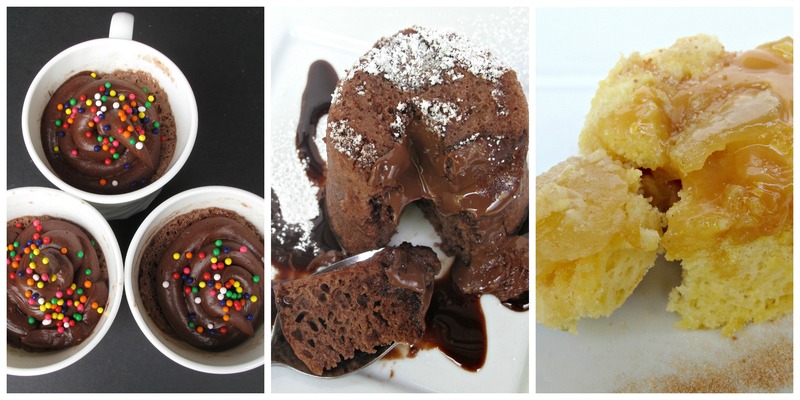 Love this mug cake! 🙂 it looks so gooey and moist-just the way I like cake to be! Thanks, Jocelyn! The key to gooey and moist with microwave cakes is gooey add-ins that don’t bake (like chocolate and pie filling) and syrup on top. That was like loosing an old friend, wasn’t it? What a fun treat you made with your new one! Thanks for the understanding, Chris! I would like to be more easily adaptable but I was just so comfortable with the old microwave. No thinking involved just press and go! 🙂 Oh, well. I am giving the new one a work out and should be used to it soon! Thanks, Adriana! I really, really wish we used the more accurate measures of the metric system in the US…but Americans freaked out at the idea. The only way to do it is to jump in with both feet (like you are having to do now in the opposite direction!) Conversion is too time consuming and confusing. Just using a new system for awhile allows you to get a feel for quantities, weights, and temperatures. Good luck! Wendy, shame on me for not visiting your blog in so long! I’ve missed out on so much deliciousness! I hate getting new appliances too. My brain is so lazy that it hates learning new things, lol. Explosions in the microwave are the worse because my body is too lazy to clean up the mess 😉 I’m glad you figured out how much time was needed because your mug cakes are amazing. Anything to get cake into my mouth in a short time period is a good thing. I love black forest cake and haven’t had it in years. Is it really legally mandatory to use cherry liquor in Germany? If so, that’s awesome! Wendy that looks absolutely decadent! I love the Pina Colada cake too! I love the combo of cherry and chocolate, and I also love things that are easy. Thanks for sharing this. Thanks, Sheryl! These “magic” microwave cakes are just fun! They will never replace the “real thing” but they are perfect for a sudden sweet tooth attack especially for college students who may only have access to a microwave. I love love black forest cake! But I still haven’t had the courage to make one yet. Your microwave version would be perfect for me to start with! YUM! Thanks, Lokness! This version isn’t quite the real thing, but it is tasty, quick, the ingredients can be mailed in a care package, and it is just about fool proof! 🙂 I will be watching your blog for when you share a recipe for the real thing!